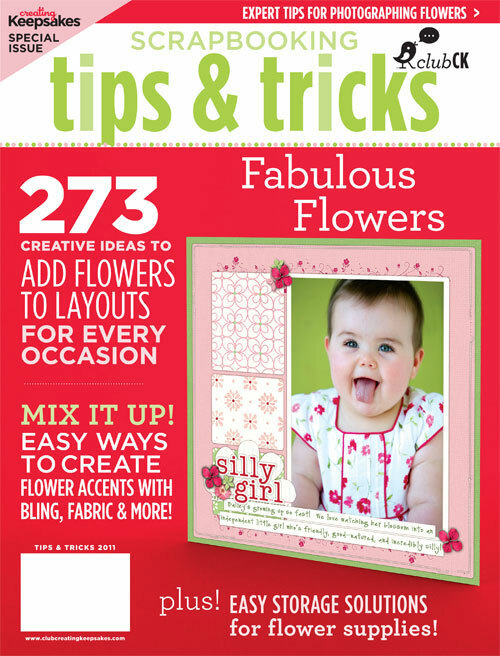 Creating Keepsakes has a new issue of its Tips & Tricks series available and this one is devoted entirely to flowers! "Are there any scrapbooking accents more versatile than flowers? Definitely not! They're the perfect pick to freshen any page. In Creating Keepsakes magazine's new special issue, Scrapbooking Tips & Tricks: Fabulous Flowers, you'll learn how to add flowers to layouts of every theme—and in a way that will enhance the design of your page. You'll learn how to use pre-made flowers in a creative fashion, easily make different flower accents, and learn lovely ways to photograph flowers for your layouts. And to top it off you'll even find ways to display and organize all of the beautiful flowers in your stash." 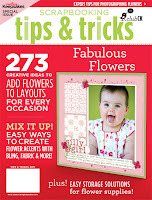 The Fabulous Flowers Tips & Tricks issue is available on newsstands soon and online at the Scrap & Paper Shop for $6.99 and will start shipping out on June 1st. They are also offering a coupon code for free shipping in the US for orders over $25 through June 3, 2011. Simply use the coupon code FLOWERBB at checkout. Do you prefer to use pre-made or homemade flowers on your projects?